Barberry shrubs are susceptible to a variety of pest infestations that cause cosmetic to severe injury. Though barberries are not extremely vulnerable to problems, keeping your plants healthy ensures their ability to resist and heal from infestations. Identify different types of barberry pests, their symptoms and management methods so your barberry shrubs remain vigorous in your home garden. Prevent problems with appropriate care of your barberry shrubs. Plant barberries in locations exposed to full sun for optimal growth and vivid color display. 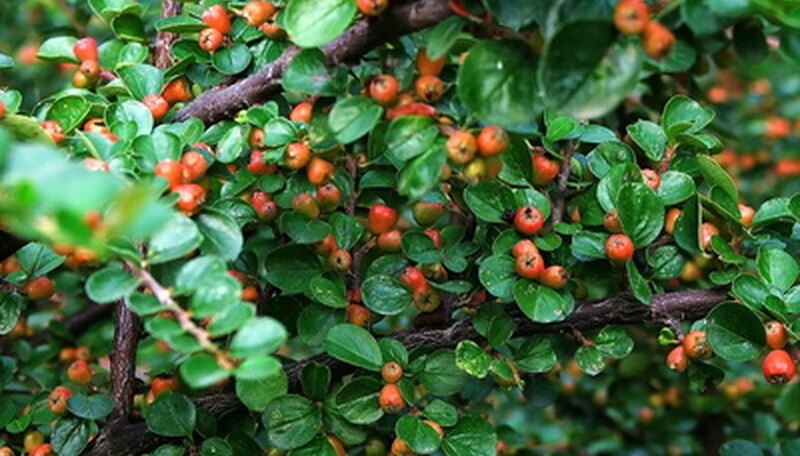 Grow in any soil type, as the barberry shrub thrives in most conditions, including both acid and alkaline pH levels and sand, clay and loam soil types, according to the University of Florida IFAS Extension. Barberry aphids (Rhopalosiphum berberidis) are insects that display yellow-green bodies and often create large infestations. Twobanded Japanese weevils (Callirhopalus bifasciatus) are female insect pests to the barberry shrub; weevils display brown, winged bodies that measure approximately 1/5 inch in length, according to The Connecticut Agricultural Experiment Station. Scale insects also affect barberries by covering plant parts with their immobile, legless bodies. Barberry aphids are "sucking" insects that feed on tissue fluids from tender areas of the plantlike shoots. When aphids feed, they excrete honey, a sugary substance that covers leaves and creates an ideal environment for a fungal infection called sooty mold, which results in more damage. Twobanded Japanese weevils chew on leaf borders and create "crescent-shaped" bite marks, according to The Connecticut Agricultural Experiment Station. Scales, like aphids, are sucking insects that feed on plant sap. Depending on the severity of the infestations, injury ranges from aesthetic damage to the potential death of your plant. Catch problems early to avoid losing your barberry shrubs. Remove aphids from plant surfaces with a strong stream of water, according to the University of Florida IFAS Extension. Consider releasing predatory insects into the garden, like lacewings, lady beetles and parasitic wasps; these hunt and kill insects without damaging plants. You can find predatory insects in garden supply catalogs or stores. Remove and destroy damaged plant parts to rid your plants of insects, according to the University of California IPM Online. If fungi are present on infected plant parts, removal decreases spread of disease to the rest of the barberry shrub. For barberry aphid chemical control, saturate the plant with insecticidal soap or the insecticide malathion as soon as symptoms are visible. If natural control is proving ineffective, chemical control for twobanded Japanese weevils includes a spray with the chemical acephate according to The Connecticut Agricultural Experiment Station. Control scale insects with horticultural oil spray, or contact a professional for safe spray of insecticidal chemicals like dinotefuran, which are not recommended for use by the home gardener.